"We carry secrets under our skin like shrapnel. Our surface wounds heal, but the damage festers underneath while we worry what tiny pieces will work their way to the surface for the world to see. "3.5 stars. Stephanie Lawton has quite a way with words. 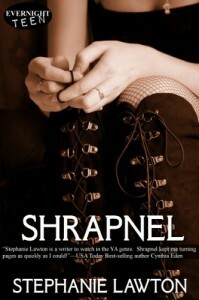 I was already in love with her writing because of her book [b:Want|13432653|Want (Want, #1)|Stephanie Lawton|http://d.gr-assets.com/books/1346678335s/13432653.jpg|18933268] but I wasn't sure how her style of writing would translate to a ghost story. While Shrapnel didn't quite have the same lyrical quality to it that Want had (which I highly recommend), I found myself slowly inching forward throughout this book, becoming more curious the further in I got. At first, I was sort of disappointed that I wasn't completely immersed in the history of it all and thought that this was going to be just another basic paranormal romance. Apparently, I need to work on my patience, because when we got to the place of finding out more about the bigger picture, I was completely sucked in to the haunting (no pun intended) atmosphere. It also didn't hurt that there was a choose-your-adventure reference, since those are my favorite reviews to write.Each character had a story to tell. The only character which didn't really resonate with me was the secondary female character Ashley, but that was okay, since I couldn't get enough of Dylanie, Jake, and Jackson.Dylanie - the damaged ingenue. Or as Jake observed : she's a pierced and inked kitten. She didn't know her place in the world and her story felt like the start of a new journey.Jake - the guy who could have it all if only he knew how to get it. He says : My parents don't like me because I've got a smart mouth. My teachers don't like because I don't pay attention. Girls don't like me because I'm one episode away from a padded room. I loved Jake's character. One minute he was smooth, the next he was half joking about how he wanted to stop crying in front of girls. He knew he had issues but he somehow still managed to come across as a hot guy. Strangely broken characters fascinate me.Jackson - the charming and scheming ghost. This one's a lady killer. His mystery only brought a new dimension to the story. A love triangle involving a ghost? I never knew if I was supposed to like him or not, which only added to the fun. "Dylanie," he drawls, "let me in. "While I thought there were a few minor missteps in this book, such as a case of insta-love on steroids, as well as mention of getting hooked on the high from a taste of another (I didn't miss it this time - my detector is back! ), the issues were minimal. I give this author credit for going out on a limb and writing something completely different from the contemporary book she'd last put out.Now that this is over, I just have to sit back and impatiently wait for Lawton's next book.